Payments over the course of history have increasingly moved towards a digital ledger system, the latest entry into this evolution of Fintech (financial technology) is the newly coined...sorry minted...sorry invented...term "fintat," meaning a "financial tattoo," that is a truly wearable temporary tattoo. Yes that was all one sentence, and yes I tried one out at Dunkin Donuts (odd, but successful nonetheless.) 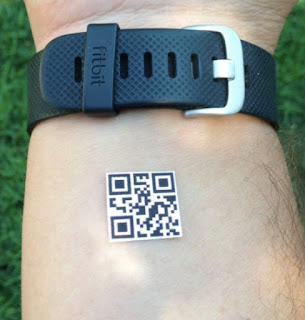 The temporary tattoo is a Quick Read (QR) code and can be washed away with soap and water at any time or will naturally dissipate over the course of a week or so. If you ever forget your wallet or go for a run you can feel at ease knowing you have cash "on" you at all times!